Very dynamic weather conditions today due to the incoming front. Skies were sunny until about 2pm, with strong and gusty SW winds above 9,000 feet. Winds were reaching well below ridgelines, see photo of numerous plumes reaching down into valleys. Around 2pm skies began to cloud up, and the winds shifted to SE for a short period, remaining strong. By 4pm skies were socked in and light snowfall had begun. Winds shifted back to SW and moderated quite a bit. Windslabs of varying densities were widespread over pretty much all aspects, especially north and east. Sheltered locations still harbored soft settled powder, with probably 2 inches of new snow from last night's system. Some south-facing slopes harbored a thin crust from yesterday, covered by the couple inches of new snow. The new snow that started falling late in the day was coming down as graupel. Evidence of wind loading was widespread. 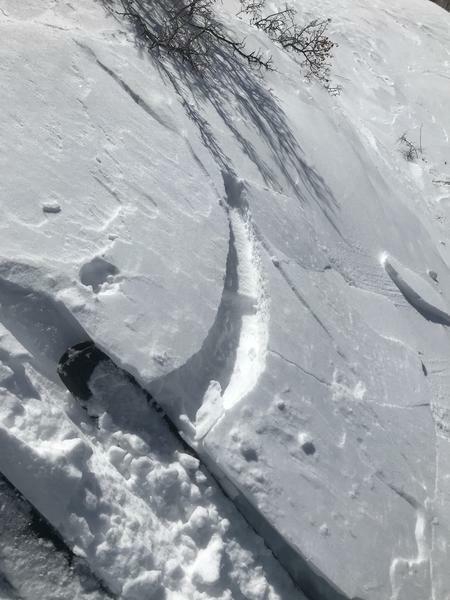 Experienced numerous incidents of wind slabs cracking and one major collapse on a wind-loaded slope. 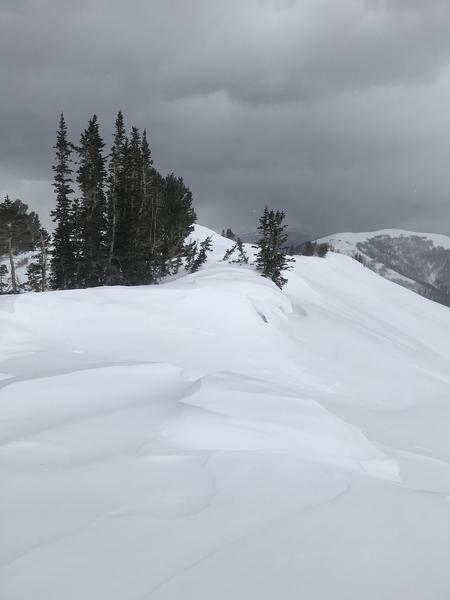 Due to a variety of wind directions, wind slabs were evident on pretty much all aspects. SW, S, and SE slopes were mostly scoured but did show some evidence of cross-loading. Additionally, during the brief period of SE winds today we observed west facing slopes being loaded. We skinned up a SW facing slope that was mostly scoured on our first trip up but was sporting thin windslabs on our second lap. I would expect North thru East facing slopes to be the most problematic due to the dominant south and southwest winds over the last few days. The plumes coming off high ridgelines and loading north facing slopes have been visible from the valley over the past few days. Toured in Sawmill Fork, Spring City Canyon, and Knob Mountain today from elevations of 6,500 to 10,500 feet. Wind has been cranking the last few days and was the dominant theme of the day. We did get a chance to view several high elevation, north facing slide paths and did not observe any signs of avalanche activity. That being said I think it is likely that the strong winds have reloaded these slide paths and obscured old crown lines. Cornices are growing, mainly above N and E facing slopes. 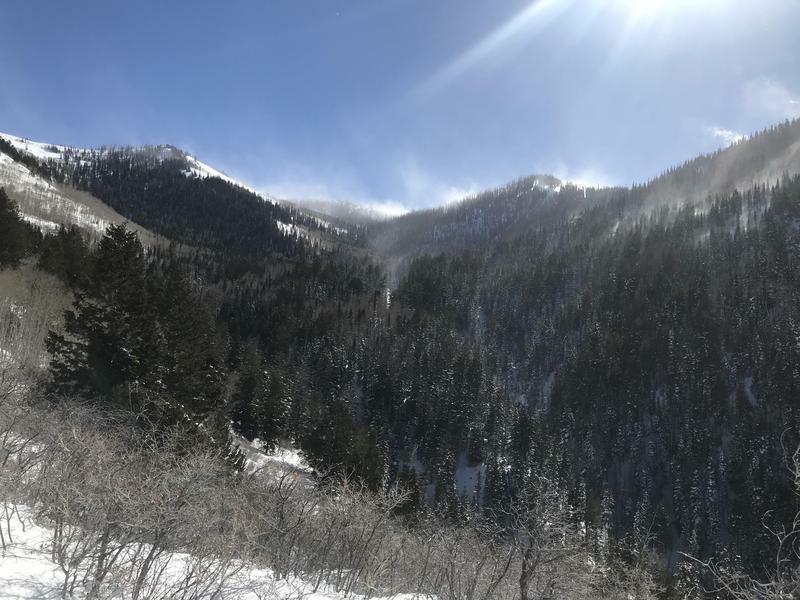 1: Wind blowing plumes of snow well below ridgelines in Sawmill fork. 3: Large cornices above an E-facing slope, with small W-facing cornice growing on top due to SE winds.